Ziziphus jujuba. 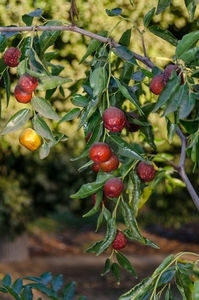 Also known as the Chinese date, Jujubes are elegant small trees to 20’ tall by 12’ wide, with gray bark and shiny, dainty foliage that gives a great autumn display of butter yellow. But don’t let their sumptuous looks fool you: Jujube trees will thrive under the harshest conditions. Most jujube cultivars are self-fertile (although they have greater yield with another variety nearby) and the abundant fruits are sweet and crunchy. Truly delicious fresh. Jujubes can dry on the tree for future use. Both fresh and dried fruit are packed with vitamins, minerals and anti-oxidants. They’re used in traditional Chinese medicine to kill internal parasites, promote liver function and improve the pulmonary system. Watch out for the daunting thorns on young growth. Suckers from roots can be a nuisance, so remove them if they appear. Our jujubes are grafted, so do not allow root growth to overtake the scion wood. No insect or disease problems. Hardy to at least minus 10 degrees F and can take almost any amount of summer heat, yet needs very little winter chill, less than 200 hours. Best performance in Zones 6-9. Full sun, drought tolerant. Best fruit set and flavor in hot summer areas. If grown in containers, you'll need at least a 15 gal pot. Larger trees below have had most of their side branches removed for ease of harvesting/potting up, so many trees shipped in spring and summer will not have a developed branch structure. They will acquire branches during the growing season. Shipping charges are 35% for CA, 40% for OR,WA,AZ and NV, and 45% for rest of continental U.S. No shipping to AK or HI. Ziziphus jujuba 'Honey Jar'. Another newer cultivar that is superlative for eating fresh. The sweet rounded fruit is small but packed with a distinctive nutmeg/cinnamon flavor. Those who do not enjoy the mealy texture of some jujubes will enjoy the crunchy and juicy bite this cultivar delivers. Dries well but why bother when fresh Honey Jar fruit is so delectable? Early to ripen and edible when there's still some green showing. Smaller tree than other varieties. Grown in 5 gal containers, pruned to fit into 4' tall boxes, 1/2" caliper, branching beginning as of June 2017. OUT OF STOCK. Ziziphus jujuba 'Shanxi Li'. A Chinese import, Shanxi Li has possibly the largest fruit of all jujubes, over 2" long. It's great eaten fresh, when it's reminiscent of Smitten apples, our very favorite apple variety. Also excellent dried. Self-fertile. Ripens in September. Good for areas with long hot summers. Grown in 5 gal containers. Pruned to fit into 4' tall boxes. No branching, 1/2" caliper, just beginning to leaf out as of May 2018. Ziziphus jujuba 'Coco'. A Ukranian treasure, this jujube cultivar is named for the distinctive coconut flavor of its golden brown fruit. Will set ample crops even on its own, but will bear more with another variety nearby like most jujubes. About 18" tall, branching, pencil caliper trunk as of June 2018. Grown in 1 gal containers. Ziziphus jujuba 'Sugar Cane'. This new jujube cultivar has the sweetest fruit of any of the jujubes. 'Sugar Cane' fruits earlier than 'Li' or 'Lang' and is a productive variety. Fruit develops over an extended period, so you can harvest at your leisure. Grown in 2 gal containers and pruned to about 3' tall. 1/2" caliper trunk, just beginning to branch/leaf out as of April 2018. Best for eating straight off tree. Fruit is small and round. OUT OF STOCK. Ziziphus jujuba 'Li'. One of the best Jujube varieties for fruit production, Li bears rounded 2 inch fruit that slowly turn from green to purple to mahogany. Seems to be most self-fertile of all varieties. These fruit-laden branches are in high demand for late summer bouquets (pair the branches in rustic Japanese jugs with copper beech, lemon clematis and bronze and green fennel). Since the small and fragrant chartreuse flowers appear after most flowering fruit trees, crops are seldom affected by late spring frosts. Trees grown in 5 gal containers, about 4' tall, 3/8" caliper as of April 2018. Zones 4-9. OUT OF STOCK. Ziziphus jujuba 'Li' 1 gal is grafted onto the same jujube rootstock as the 5 gal trees and will catch up in height and girth in about 5 years. As of October 2018, trees are going dormant, well developed, branching, about 2' tall. Like the 5 gal specimens, 'Li' is self-fertile and bears delicious fruit for eating fresh or dried. It's always gratifying to grow a tree from a small specimen to its mature size. Ziziphus jujuba. 'Lang' produces fruit that are easily mistaken for baby Bosc pears before turning their beautiful burnished mahogany. They're incredibly tasty when fully ripe, but not until then. Wait for the fruit to turn dark before eating. These fruit are also excellent if left on the tree to dry. Tree is upright and nearly thornless. Partially self-fertile, which means you can grow just one tree and get fruit, but you'll get more if you have two different varieties. Fruit ripens in early to mid-September. Grown in 5 gal containers, about 4' tall, 1/2" caliper as of September 2018. Ziziphus jujuba 'Lang' 1 gallon. As of October 2018 these jujubes are going dormant, about 2' tall, well-branched, pencil width caliper, some fruit. Same size as other 1 gal jujubes, see photos above. Ziziphus jujuba 'Sherwood.' The fruit of Sherwood has an uncanny resemblance to dates when dried. It's also fantastic fresh, when the color turns from green to reddish brown. This selection is a little taller and narrower than the other varieties and is not as thorny. Ripens late, mid-October, so not a good choice for areas with early frosts. Will set more fruit with another variety for pollenization. Pruned to fit into 4' x 1' x 1' boxes, grown in 5 gal containers. Ziziphus jujuba 'Contorta.' You'll never find a more magnificent sculpture for your garden than the contorted Jujube tree. In the winter the twisted branches are prized for their sculptural qualities. In the spring those branches are covered in celadon lace when the new leaves appear, and in summer the mahogany fruit dangle from the gnarled arms. Plant this rare tree in a special spot and light it from below for the most beautiful garden accent you can imagine. Zones 4-9. Trees grown in 5 gal containers and have been pruned to fit in 4 foot tall boxes. 1/2" caliper trunk. OUT OF STOCK. Ziziphus jujuba 'Contorted'. Contorted jujubes are smaller than other varieties, bear good tasting fruit earlier in the season, and have a weeping habit. Self-fertile but like most jujubes will yield a bigger crop with another variety nearby. As of February 2017 this tree is well developed, about 4' tall, some branching, 1/2" caliper trunk. TEMPORARILY OUT OF STOCK. Ziziphus jujuba 'GA866.' A jewel of the Chico Research Station, this jujube is renowned for its dizzying sugar content and concentrated apple flavor. The 2" long fruit is eaten dried, fresh, or made into a sublime ice cream. Needs a long hot summer to ripen. Ready to harvest earlier than other varieties, in mid September, so good for areas with early frost. These trees have a 1/2" caliper, some branching, about 4' tall, and going dormant as of October 2018. Grown and shipped in 2 gal containers. OUT OF STOCK.